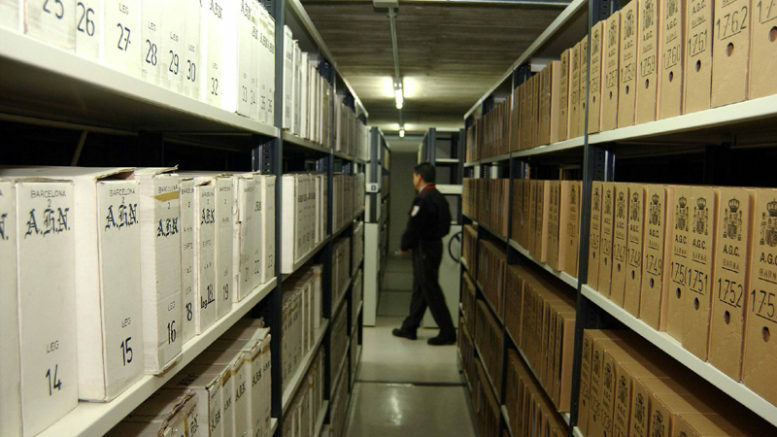 A special commission of Spain’s Defense Ministry has recommended that the government open to researchers the contents of 500 boxes of sealed documents in the General Military Archive in Avila that contain classified information on military activities during and after the Spanish Civil War. Included in the documentation is said to be information on the operation of concentration camps and the forced labour of thousands of prisoners of war and civilians detained by the regime of dictator Francisco Franco in the war’s aftermath. The Commission for the Classification of Defense Documents approved a report recommending the ministry authorize general access to documents classified as confidential and kept under restricted access in the Avila military archive under the terms of Spain’s Official Secrets Act of 1968. In April, the previous conservative Partido Popular (PP) government of President Mariano Rajoy suddenly restricted researchers’ access to classified Civil War documents housed in the Defense Ministry’s General Military Archive in Avila, as well as all historical documentation classified as “secret” by the Franco regime kept in any archive of the Spanish military and dated prior to Spain’s Official Secrets Act of 1968. The move is seen as the first step by the administration of President Pedro Sánchez to open files believed to contain the history of repression by pro-Franco forces both during the 1936-39 war and the 36-year dictatorship that followed. But, the announcement that just 500 boxes containing thousands of documents are to be opened was criticized as not going far enough by some political parties to both the left and the right of Sánchez’s governing Socialist party (PSOE). The Communist-led Izquierda Unida (IU, United Left) party called on the Sánchez government to make public whether or not it is only going to allow in situ access to the documents by researchers, or if it intends to actually “finance the identification and description of the declassified documentation, as well as its digitization so that it can be published on the Internet”. The party has also alled for an investigation into documents believed to have been destroyed by military authorities during the dictatorship and the 1980s period of transition to democracy in Spain. At the same time, the regional Partido Nacionalista Vasco (PNV) reiterated its call for Congress to modify the 1968 Official Secrets Act and to overturn decisions made by three different Consejos de Ministros (Council of Ministers) in 1986, 1994 and 2010 to keep the Spanish Civil War documentation secret. All images at ProgressiveSpain.com are the copyright of their respective authors/owners and are reproduced here for non-commercial, journalistic purposes in accordance with Fair Use doctrine. All other content is Copyright © 2015-2019 ProgressiveSpain.com and is licensed under a Creative Commons Attribution-NonCommercial-ShareAlike 4.0 International License.